Imagine if you will, someone who, on one of her Facebook pages describes herself as a “retired locomotive engineer” and on the other, as an “entertainer” – more accurately, a burlesque entertainer. From who she was, to who she is; this is the story of Miss Chevious Cinders and how she became the Grand Dame of New Zealand burlesque. When she’s not “in character” as Miss Chevious Cinders, she is simply known as Cindy. Born in Takapuna, Auckland in 1936 (yes, she’s 78!) and bought up by her grandparents, Cindy says she always knew she was “different.” And different she is … in the very best of ways! As early as the mid-60’s, Cindy says she was cross-dressing, but only in the privacy of her home – she took photos, but developed them herself, scared to take them anywhere in case she was found out. She started working for the railways in March 1954, where she fired steam locomotives and drove steam, diesel and electrical trains until her retirement in November 1990. 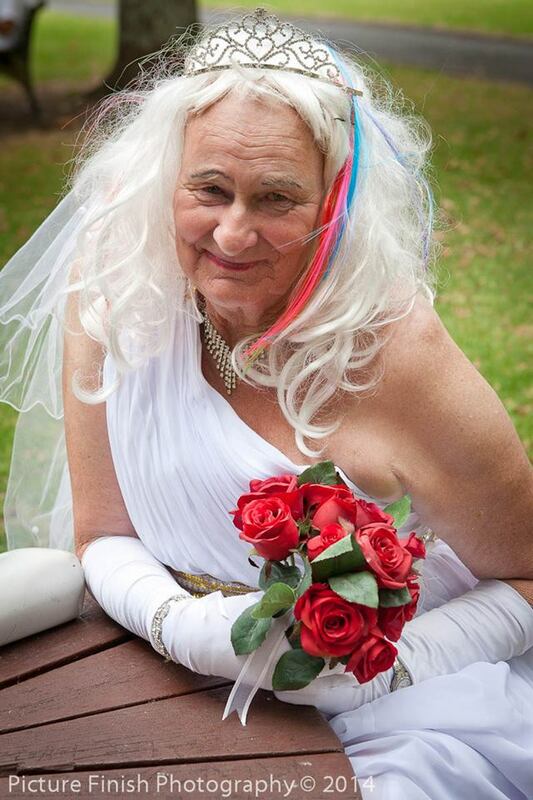 Cindy lived in the NZ Rail Hostel for thirteen years, and in 1965 went to her first “vice versa” party where she said she “had a lot of fun.” In 1975 she met her future wife whom she married three years later and fathered two girls – Cindy thought her cross-dressing days were over. Unfortunately for Cindy’s marriage however, they weren’t – she returned to her cross-dressing ways; got found out and got kicked out in January 1994! During that period, Cindy started to cross-dress more often and when she discovered the internet and typed in “cross-dressing” on her computer, a whole new world opened up for her. 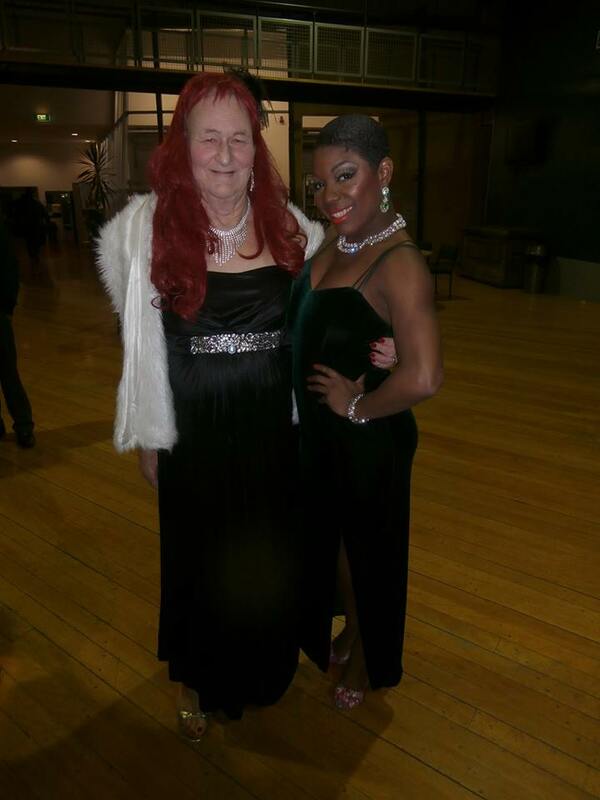 She joined transgender groups, re-named herself Cindy and met her long-time friend, Dot. Cindy and Dot started going out together dressed as women, mostly after dark, and mostly to the late night pictures. Cindy felt she’d worked out what had been “bugging” her all those years and in 2002 started hormone treatment as the first step in her journey to becoming a woman. A year later she officially changed her name to Karen Cindy Jane and after selling her home in 2004, found herself with some available funds and decided to pursue sexual reassignment surgery in Thailand. She and Dot flew over on the 20th of March 2005; Cindy had the surgery and they had a holiday together in Thailand. The rest, as they say, is history. 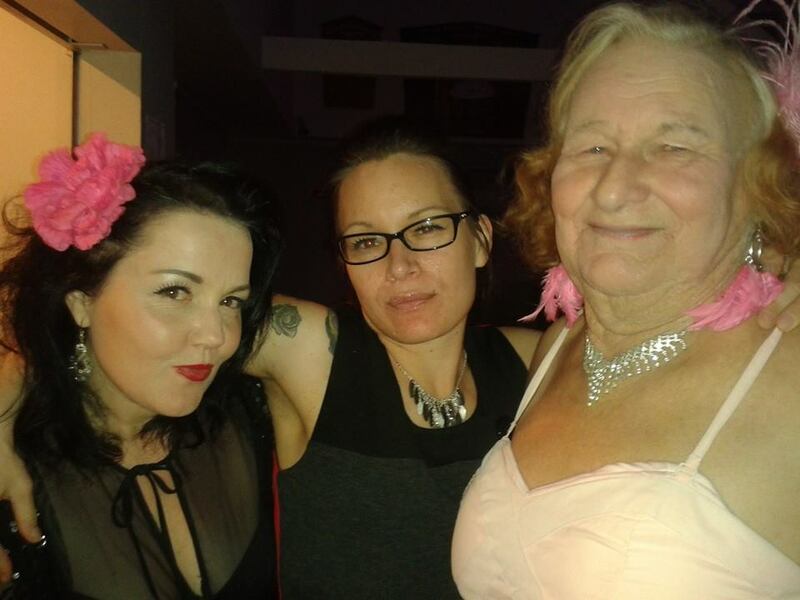 Now, nearly ten years later, Cindy has firmly established herself as one of the most colourful and loveable characters on the NZ burlesque scene and is actively involved in the pride movement too. She says all transgender people really want is acceptance; not to be treated differently or to be changed, but just to be accepted and loved for who they are. Cindy credits her happiness in the last few years since she had her sexual reassignment surgery to the level of acceptance she’s found from the people in the community she’s created for herself. As a woman who has accepted and embraced her true self, Cindy is finally living the life she deserves. She’s one of the lucky ones too – her family have accepted her as she is and she enjoys the company of her two daughters and eight grandchildren, who call her Gran. She attends workshops too and this year was invited to perform at the NZ Burlesque Festival in the Promenade event – a performance for which she was proud to receive a standing ovation from her adoring audience. 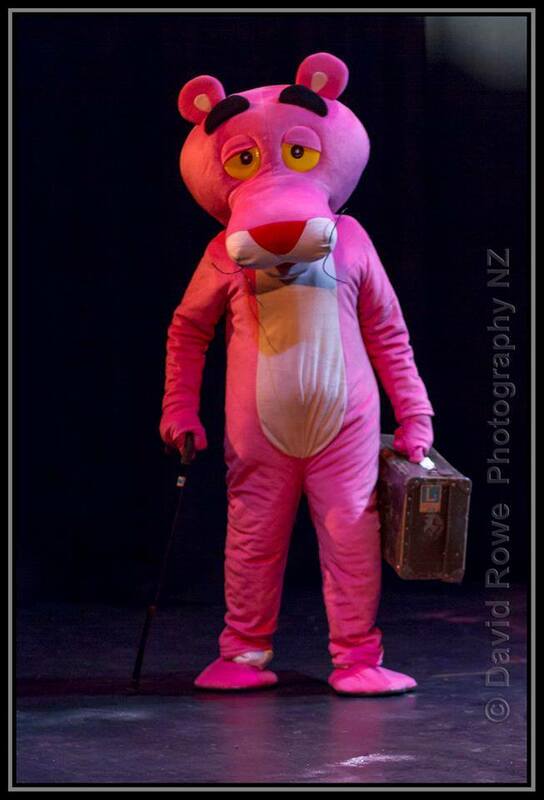 Her Pink Panther routine has reached almost iconic status here in New Zealand, and has been performed for many lucky audiences – I’ve personally seen it several times, and each time, it makes me happy and so proud to be a friend of Cindy’s. Cindy’s Facebook status updates show a woman on a mission! She’s hopping a bus to a show in Palmerston one minute; then she’s back for a few days, then catching a plane to Australia to attend a festival somewhere. Then she’s off up to Auckland to watch a show and attend a workshop, then back home. She shows up regularly at burlesque class and often has a new set of fans, or another addition to her costume wardrobe to show us! She appeared in the “Bring Back Burlesque Christmas Show” at the Riverlea Theatre in 2013 and has overseas trips and plans booked all the way out to April next year! At the NZ Burlesque Festival this month, Cindy earned the title of “Industry Groupie” which was an honour very fitting indeed! Aside from her groupie activities, she spends time with her friends and family and the boys down at the Workingman’s Club! Phewww … I can only dream of having that much energy now, much less at 78! So all in all, Cindy would say it’s been a good life so far and there’s still lots more fun to be had; lots more shows and workshops to attend and lots more international burlesque stars to be photographed with! Acceptance and love … they really do make the world go round … and characters like Cindy, aka Miss Chevious Cinders, add that extra layer of sparkle and character. If you’d like to watch the short film Cindy has made about her transition from male to female, you can click here. Click here to watch Cindy’s peformance at the 2014 NZ Burlesque Festival in Palmerston North. Posted on June 20, 2017 September 24, 2018 by MumptyStylePosted in Burlesque/PinupTagged burlesque, Cindy, Grand Dame, Miss Chevious Cinders, New Zealand Burlesque Festival 2014, NZ Rail, Perle Noire, Pink Panther, Pride Parade, Saacha Midnight, transgender, transsexual. Next Next post: Are apps and Photoshop ruining your self-esteem?